Brighouse Town, abiove, make the trip to rivals Tadcaster this weekend. The Celts will look to maintain their recent form following their impressive win against National North side, Alfreton Town, in the FA Trophy last weekend. 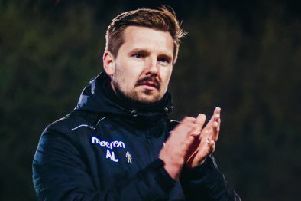 Adam Lakeland’s men are currently seven points behind leaders Scarborough Athletic but with four games in hand. The Evo-Stik East Division currently sees Brighouse Town, Tadcaster Albion and Pontefract Colleries all vying for the play-off places. Brighouse make the 64 mile-round trip to Tadcaster for what looks to be the game of the day in our region. With neither team losing in their past five league games it looks set to be a thrilling 90 minutes. Fourteenth-placed Frickley Athletic host fifth-placed Pontefract in another eagerly anticipated derby. Frickley have lost their four previous league games, with Pontefract being defeated in two out of their previous four. Elsewhere, Ossett United visit Wisbech Town and Pickering Town make the trip to Stamford. Harrogate Railway, currently in the relegation places, face Knaresborough Town who are sitting in fifth place. Railway have only managed to win one game this season while Knaresborough have lost their three previous games and will be looking to end their losing streak. Fourth-placed Hemsworth Miners Welfare visit Maltby Main with both sides unbeaten in their last four games, however Hemsworth have won nine games compared to Maltby’s six. The Premier Division also sees Garforth Town play at Goole AFC and Liversedge will host Eccleshill United. In the Northern Counties East League Division One, third-placed Selby Town travel to eighth-placed Dronfield Town. Selby are in good form, winning their last six games and will be hoping to capitalise on that tomorrow. Glasshoughton Welfare travel to bottom-of-the-table FC Bolsover who are yet to win a game this season. Elsewhere AFC Emley visit Grimsby Borough.